Lamahatta has been developed as an eco-tourism place in late 2012. Earlier in the same year when the Chief Minister of the state Ms. Mamata Banerjee was passing by Lamahatta in March, she stopped by for a while and took some pictures of this roadside mountain village, its vast stretching forests of dhupi & pines, and the magnificent views of the peaks and rivers around. Soon with support from the state government, the villagers and forest protection teams worked together to create a lovely tourist place. Lama in Lamahatta stands for Buddhist monk and Hatta for hut - a monk's hermitage. The main inhabitants here are tribes like Sherpas, Yalmos, Tamangs, Bhutias and Dukpas. They have all come together to join hands with the government workers to create an eco tourism place with a government funding of about Rs. 1.5 crores. So what does eco-tourism actually mean for Lamahatta? It means that the ecological balance and the bio-diversity of the environment will remain undisturbed, and the inhabitants of this place will work closely with the tourism development here and run such operations so that they earn out of it and make it sustainable in the long run. As a result several homestays have come up here, all owned by the local villagers. There are 15 rooms with a total of 34 beds and all accommodations have basic amenities including attached toilets, basic furnishing, beds etc. In addition, five tents have been created each with attached toilet, twin beds, cupboards etc. Each tent can accommodate two persons. While all these are developed on one side of the road, on the other side of the road a vast stretch of beautiful manicured garden has been created along the slope of the hill and under the dense dhupi and pine forest. This is the 'Roadside Garden'. From the homestays, you just walk across the road to the entrance of this garden. The garden is full of seasonal flowering plants including white and other colorful orchids. There is an entry fee of Rs. 10/- per person. You will get tickets at the small ticket counter on the opposite side of the road. A young lady manning the counter will also volunteer to show you the homestays if you so want. There is a pathway which goes through the park for taking a leisure stroll. Along the way you will find wooden & bamboo made gazebos where you can relax and soak in the charm of the garden. There are wooden benches on the pathway as well. You will see a row of colorful prayer flags fluttering in one side of the garden. Locals say that the breeze that passes through the prayer flags purify the surroundings and minds of the people. There is also an wooden watchtower created to get the best possible views around Lamahatta. Locals call it 'Machan'. Actually you get magnificent views from several different places in the garden. What can you see? 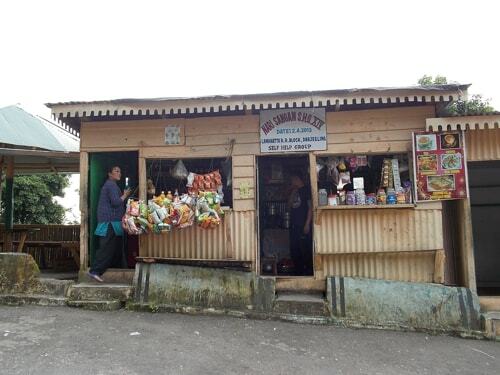 Probably some of the best that any place in Darjeeling district offers .... on a clear day you can sea the snow peaks of Kanchenjunga, Tiger Hill, Namchi of Sikkim, Darjeeling town and its landscapes, and the Rangeet river flowing below. Overall, Lamahatta offers a serene, quiet and a romantic environment. It's ideal for honeymooners or couples who would like to spend some quiet and intimate time with the nature, take some nature walks through the maze of dhupi jungle, enjoy the beautiful garden & the views around as well as several other natural attractions nearby. If you take interest, there are plenty of natural attractions that you can explore in and around Lamahatta. 1) I have already mentioned about the beautiful roadside garden which you should enjoy. It's a great place to get views. There are ethnic shades around the garden and some meant for meditation (you will need to take your shoes off before you enter those shades). You should climb the watch tower (short flights of steps) and enjoy the excellent views on a clear day. a. There is a short nature trail that leads to a small lake on a hill top. The villagers consider this to be a sacred lake. b. You can also do jungle trekking... There is another trail of around 8kms from Lamahatta to Takdah that goes through a maze of pine and dhupi trees. d. Trek to the Gari Danda - an old fort on top of a hill which is about 3kms away. 3) Tea Estates: Visit the tea gardens nearby (you will get one within about 1.5kms). Some of the well known tea estates nearby includes Glenburn Tea Estate, Rongli Rangliot Tea Estate, Takdah Tea Estate etc. 4) View Points: Peshoke View Point is about 8kms away where you can see the wonderful confluence of rivers Teesta and Rangeet, a place knwon as Triveni. 6) Understand and enjoy the Village Mountain Farming System in Lamahatta. 7) Visit the Lamahatta Village Monastery (Gumpa). If you are passing by Lamahatta, stopping over for some time and like to have a light meal, the best place is the small tea stall run by a lady by the roadside and opposite to the garden entrance. She has a top covered seating place right next to her stall. Try out the Local Thukpa. It's really great. She makes it herself and claims she is the only one making it in this area. The local thukpa will have some local pasta which she makes herself, a reddish soup, vegetables and if you want non-veg thukpa, she will add some ground chicken. Delicious! She also makes nice momos. You can also get chowmein, chapatis with vegetable as well as tea & coffee here. From Siliguri the road distance to Lamahatta is about 72kms and will take about 3.5 hours. You will need to come to Jorebungalow near Ghoom and then take the road for Lamahatta. Easiest is to take a taxi from NJP station. Otherwise take a shared jeep up to Jorebungalow and then another one from there up to Lamahatta. From Darjeeling the distance to Lamahatta is 23kms. Best is to take a taxi which will take little over an hour to reach. 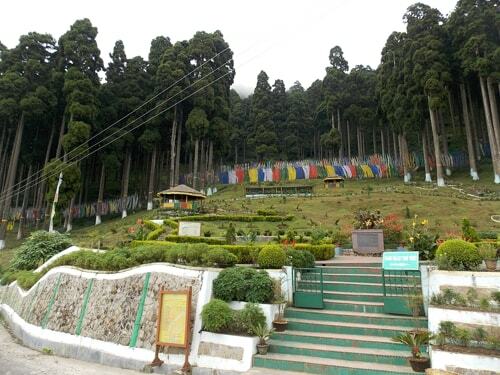 If you are coming from Kalimpong, the distance is 41kms (about 2 hrs). As I said this is an eco tourism spot and being mainly developed by the villagers with help from the state government. So do not expect professional services or amenities like in a hotel. Instead you will get the warmth of the villagers, their uncluttered attitude and help, they will cook meals for you (of course you will need to tell them in advance what you want to have... they have limited non-veg and veggie items though). Additionally you will get the opportunity to understand their life and culture. Homestays and the tents here are basic and simple. Do not expect any luxury other than the bounty of the nature. Visit Lamahatta Homestays & Lodges for more details about such accommodations, rates and contact information. I went to Lamahatta in June 2016 and found the place serene and calm. Have visited the roadside garden, the lake atop it and many spots nearby. 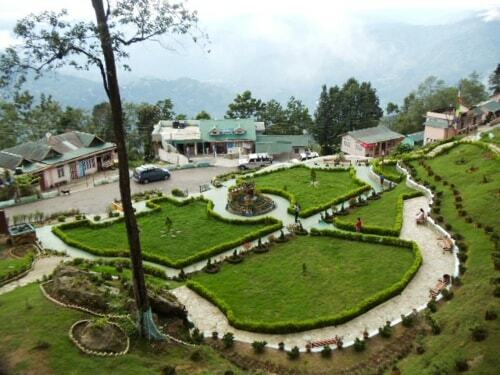 The homestays are clean and spacious mostly offer an clear view of the Kanchenjungha. I stayed in the Everest Hut of Tashi Sherpa . He is a man of great enthusiasm and energy. He especially takes great interest in taking care of the guests of his homestay. Although the food of his homestays are a bit of high ( chicken pokora is 250 rupees per plate , for example ). Also the car he uses for transportation of the tourists is a bit of expensive. Do bargain with him for the fare. But the hospitality is unparalleled and also the warmth of his family. Another interesting place of visit is the hidden caves known as Gumphadara caves. Hidden beneath the huge rocks these rocks were once the shelter of the monks who took shelter in there. One can find several paintings inside the rocks. The path leading to the rocks is scenic and picturesque amidst the lush green tea gardens of the area. I am just sharing my experience about Lamahatta. About 1 year ago in the month of June I went to the place with my wife. Somewhere I had learned the name Lamahatta. I didn't have any idea. I reached Siliguri to go to Darjeeling. At the eleventh hour I changed my mind and went to Lamahatta. After reaching there I felt really bad. A small village nothing much to do. Well we checked in to hotel Mountain View. At first we just made a booking for 1 day. But gradually I began to love the place. The couple Mr. Dhiren and Sujata chhetri are down to earth people. I am really impressed with their warm hospitality and also the local villagers. 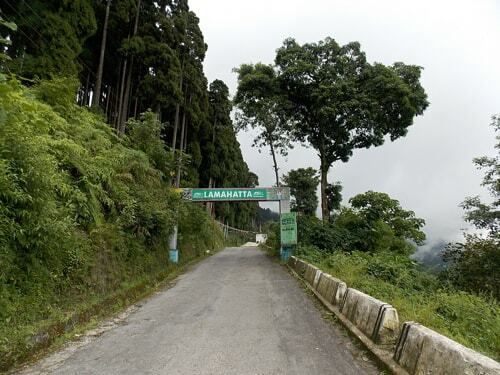 Lamahatta really does not have much things to do like Darjeeling or Gangtok. It just has an eco tourism park, an old monastery and few things more. But the local people who inhabited the village will really touch your mind and soul. And 'Norden' a local lad with a lovely voice. I cant forget the guy. Specially his 'mon majhi re' song. They have a musical band there. We also sang some songs with them. It was really nice to go there. And now I can feel thankful that at the end I changed my mind and went to the place. Thank you. I had gone to Darjeeling on 7th April, 2015 with my husband and three friend couples, all are senior citizens. On 10th April, we had gone to Lamahatta by car around 11 am. Reaching the spot we were charmed with its scenic beauty. Some local people asked us to go to the upper part to see the lake with its very nice beauty. I along with husband and other 3 male members went there, but about 5 min. before the site they stopped and only I had then gone further up to the lake. I had seen the lake and taken photographs in my mobile. I stayed there only for 5 to 10 minutes. When I was returning I did not see any trace of the path to reach to my husband. I had totally forgotten the path, I could not see any signage to locate the path or any guide, or any local people to find out my friends. I was totally lost in that deep forest. I searched for 2-2.30 hours, there was no mobile tower/connection. With great anxiety my husband also searched for me near the water body for half an hour. I cried out but nobody heard. After some 30 minutes and not finding me, my friends alerted the local people, but they also could not find me. After some 2 and half hrs they finally found me following my vigorous shouts and cries. And I came out from this deep forest with their kind help and blessing of almighty god. So I caution all the tourists to go to Lamahatta lake with the local people and guide. There are also snakes and leopards. My friends had also seen a poisonous snake in the rough passages on the way to the Lake.